Now things are starting to get interesting. My entire class passed the CDL-A exams on our first try, so today we got to drive the trucks! I went in this morning expecting to get out to the trucks right away, but unfortunately we had to wait a while as the class before us was finishing up some testing. So we started going over pre-trip inspections. There is a lot to know in this area and we must know it word for word. They said by the end of the next three weeks, we'll be saying the pre-trip inspections in our sleep. We spent almost the entire morning going over this, so it's very important to know it all. By the end of it, I was ready to jump out of my shoes I was so anxious to get out to the trucks! To finish off the morning, we watched a quick 10 minute video on shifting, then we went to lunch. After lunch, first thing we did was to break into groups and we were assigned a truck! Man, I was so excited and nervous all at the same time. Emotion overload, that's for sure. 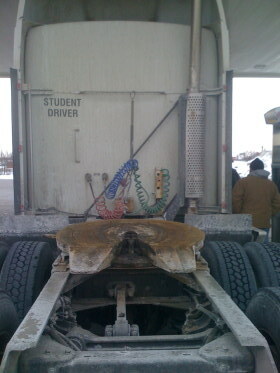 I was in the truck with four other students, which was a little more than I was hoping for, but today was an exception. After tomorrow, there will only be 2-3 of us in the road trucks and the rest of us will be in "the yard" with different trucks practicing in the obstacle course, which is mostly backing skills. We'll just rotate between the road trucks and yard trucks. So anyway, for our first day driving, we did not have a trailer hooked up. They wanted us to learn how to shift before we got into that. 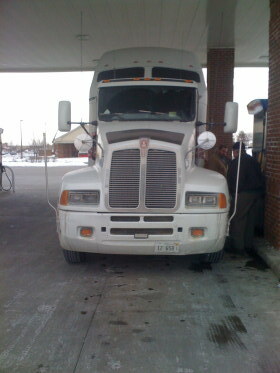 I was hoping I'd be the first to get into the driver's seat, but the way we were situated, two people were ahead of me. For starters, we just made a 2-3 mile circle around the park. The first guy did pretty well. He was grinding gears a bit (we all did), but was still able to shift pretty well. The second guy that went was pretty shaky to start. And when I say shaky, I mean literally. We were jumping forwards and backwards, side to side...actually it was a bit scary! But he started to really get the hang of it by the end of his turn. Next up was me. 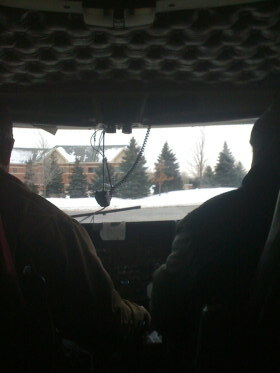 Sitting in that driver's seat was very intimidating. The steering wheel is huge, the pedals are huge, the shifter is huge, it all just felt so unnatural! This is definitely a change from my little 4-cylinder sports car! But there was nothing I could do now! So I put on my seat belt, pushed the clutch in, stepped on the brake pedal, released the parking break, and was ready to go. Since no trailer was attached, I was instructed to start off in third gear. This was actually the easiest part of the trip! I let the clutch out, gave her a little gas, and it was a smooth take-off! Ok, good start. The First Truck I Ever Drove! The next step was to shift into fourth gear. These trucks require that you "double clutch," so I put the clutch in, let off the gas, shifted into neutral, released the clutch, gave it a little bit of gas, and put the shifter into fourth (all within the matter of one second or so). It was a little shaky, but I think I did a pretty good job! Next up, a decent sized curve. This is when I really realized just how big the steering wheel is. This isn't like turning a car! I let up on the gas, let the truck coast a bit, and made the right hand turn with ease. It was awkward, but I did a nice job. Here's where it gets sketchy. I had to shift into fifth gear. Without getting too detailed, I basically had to select a switch to go from "low gear" to "high gear." So essentially, fifth gear is in the same spot as first gear. I flipped the switch, went for fifth gear, and was greeted with the wonderful sound of metal on metal grinding together. I dropped her back into neutral, let off the clutch, gave her some gas, clutch back in, and tried shifting into fifth again with the sound of grinding gears. Arrrg! On the third try, my instructor showed me that I was simply putting the shifter too far to the left (towards the reverse gear). So with his help, I was able to guide it into fifth. Now we're getting some speed! Luckily, I wasn't too upset about the grinding gears since each student before me did the same thing on various gears and I was far from the worst. But it was still a bit frustrating. Now it was time for a brake check. I was coming up on a stop sign that meets up with a two lane state road. I began to brake, but not much was happening. So I pushed a little harder on the pedal. These brakes are like on/off switches! They are very sensitive so I began to overcorrect. Too much brake, not enough, too much, not enough... I sort of came to a humorous "rabbit hop stop" but I got the job done! What a surprise those brakes were! Once again, I wasn't the only one who experienced this problem. I had to make a right hand turn onto a public road, which wasn't a problem as there was no traffic. So, right blinker on, starting in third gear, no problem. My shift to fourth wasn't so friendly to the gears. Once again, I was grinding the gear. This time I was shifting to the right spot, but the engine/road speed wasn't correct (too slow). Finally on my third attempt, I gave it a nice engine rev and was able to slip the shifter into fourth gear. The sound of those gears grinding is horrible! I made another right turn back into the industrial park, where I was much more comfortable. At this point, we were coming up on a another turn in which I had to downshift for my first time from fifth gear to fourth gear. I flipped the switch to engage "low gear," put the clutch in, shifter in neutral, clutch out, blip of the throttle, and it slipped right into fourth gear like butter. I nailed it. That was such a great feeling. But again, when I tried to shift backup into fifth, I was grinding all over the place. This time I was able to correct it on my own, but it's still frustrating when I grind the gears. Finally, I got to the spot where we were due to change drivers. There is a cul de sac (built for trucks) that I went around, came to a stop, shifter in neutral, parking brake on, and I was done! Wow! What an experience! Rhonda, you were right, this is far different from a manual transmission car. Holy smokes! There isn't even a comparison! For those of you who have never driven a manual transmission vehicle before, don't even sweat it. Those who have driven manual transmission cars have absolutely no advantage over you. None at all. The good news is, the improvements just from today are substantial! I'm still having some issues with fifth gear. A couple times I shifted into seventh instead of fifth and also had a grind going intofifth a couple more times. I think I had a grind in fourth gear again too. But during my last turn driving, I really started to get the hang of it. By the end of it all, I was feeling pretty confident. 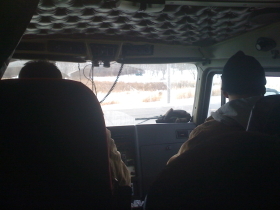 While I was still having a little trouble shifting, I didn't need any assistance from the instructor getting it in gear. Even if I made a mistake, I was able to correct it. My braking also improved by 1000%. Nice and smooth now. We were told that everything should actually get easier once they put a trailer on the back. These trucks weren't designed to drive without a trailer, so the issues we were having with the brakes and some of the gear grinding will be resolved as soon as a trailer is hooked up. I hope he's right! All in all, even though I told you about all of my embarrassing mistakes, I think I did very well. Out of the four of us, I think I was second best with an award for "best finish." The guy who I think is better than me didn't do well his last time out. I did very well and saw a vast improvement in myself. Between myself and the other students, I'm going to have nightmares about those gears grinding. The instructor was actually very patient with us and said it's all a "part of the learning curve." Actually, I think he was the calmest one in the truck! On our last trip out, if we'd grind a gear or anything, he'd just take a sip of his coffee or yawn as if saying "ok, whatcha gunna do now??" HA! By that time most of us were able to figure it out and get it into gear. With that said, I'm terrified of going onto public streets!!! Tomorrow, we will spend some time in the classroom in the morning, then hook up a trailer. They plan on bringing us onto public streets already. Now, that's a scary thought! We're also going to be in the yard learning how to back up and drive the obstacle course. They don't waste much time! So I'll update everybody tomorrow. I'm a bit nervous about driving with a trailer, let alone on public roads. I feel like I already have too much to concentrate on. But I'm sure with a bit of experience, I'll get better each and every time we take the truck out. Wish me luck! While I'm having a ton of fun, this is a lot harder than I expected!!! This wraps up week two of my adventure in truck driving school. I'm having a great time sharing my experiences with everyone!